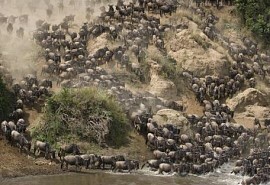 Travelling on a budget but still want to experience the highlights of Kenya? Then this 7-night itinerary is ideal. Enjoy forest walks at the foot of Mount Kenya while staying in a timber lodge, and marvel at the pink flamingos in the Lake Nakaru National Park, which is home to dormant volcanoes and soda lakes. One of the highlights of your stay will be the opportunity to spot the Big 5 in the Masai Mara National Park, famous for the Great Wildebeest Migration. From US$2335 in low season to US$2680 in high season, per person sharing. Once you arrive at Nairobi International Airport, you will be met by our representative and transferred by road to the hotel. You will overnight at the Stanley Hotel in a standard room. The Stanley Hotel is a charming hotel that has become a well-known landmark. It's conveniently located in the main shopping area of Nairobi. The Stanley Hotel is the chosen hotel of film stars and local celebrities. After breakfast on day 2, you transfer by road to the Samburu National Reserve. You will spend 2 nights at the Samburu Sopa Lodge, including 3 meals per day and daily game drives. The Samburu Sopa Lodge is located in the heart of the Samburu National Park which is a low lying, semi-arid plain home to the Ewaso Ngiro River. Elephant, hippo and crocodile are in abundance. The lodge is built on raised ground, allowing for panoramic views of the surrounding area. The morning of day 4, you travel by road to Mount Kenya and overnight at the Serena Mountain Lodge on a full board basis. 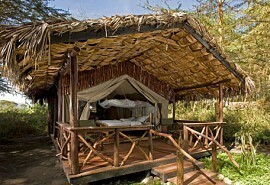 The Serena Mountain Lodge is a timbered lodge located in the forests of Mount Kenya, which is Kenya's highest mountain. 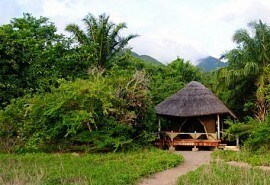 The Serena Lodge is raised on stilts above the forest canopy and guests can enjoy forest walks. 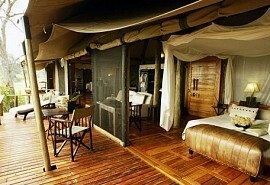 The lodge overlooks a waterhole and salt-lick which attracts both elephant and buffalo herds. An early start this morning to transfer by road to the Lake Nakuru National Park for a game drive. The fifth night is spent at the Lake Nakuru Lodge on a full board basis. The Lake Nakuru Lodge is located in the Lake Nakuru National Park, which boasts a diverse ecology. It's most fascinating sight are the bright pink flamingos and pelicans. Located along the Great Rift Valley there are views of dormant volcanoes, soda and freshwater lakes. Up bright and early, travelling by road to the Masai Mara National Reserve – undoubtedly the highlight of your safari. You will spend the next 2 nights at the Sopa Mara Lodge on a full board basis and spending your days on game drives. The Masai Mara National Reserve is famous for the viewing of the Great Wildebeest Migration, which takes place between July and October. The Sopa Mara Lodge is one of the first lodges to be built in the reserve and is ideally located on the Oloongams Hills which offers a great vantage point for game spotting. The lodge is a basic and comfortable option designed with an ethnic feel. Today you transfer by road back to Nairobi, arriving around lunch time. You will be dropped at a hotel in the city center or Nairobi International Airport. End of services.